I’ve managed to keep myself in only ONE bee for this year and what a lovely bee it is. The Stash Trad Bee…a rather tame name for a group of uber talented ladies who can made complicated traditionally styled blocks from their personal stash of fabrics. I was the very first month of the year, so I’ve been making blocks for other quilts ever since. And there are just a couple more months to go! Kati’s month was July and she had a lovely color scheme of Yellows and Greys which we mixed with a Kona Snow Background. 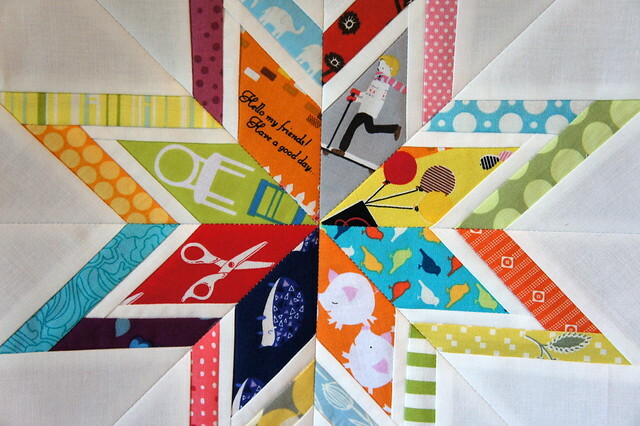 Kati asked for any paper pieced star pattern. Well surprise, surprise…I didn’t make it easy on myself. You see, I had fallen in love with Charise’s pattern and bought it from her little shop on Etsy. It is called Starburst Spools. I checked with Kati before making it to make sure it was “star” enough for her vision and she gave me the green light to work on it. I’m not going to lie. It’s not my best work in the world. I found the pattern difficult and more time consuming than I expected (but I ALWAYS underestimate time). Those spools are definitely the toughest part of the block. This block is only 12.5″ big, so everything is pretty darn tiny. But overall I’m pleased that I tackled it. My husband laughed and said I wouldn’t be happy if I wasn’t pushing myself…which is true. But that also means that I will have moments that I am not as happy as I would have liked to be. I’ve evaluated what I did and I think I have figured out what I would do differently if I were ever inclined to make this again…but it’s sort of a one of a kind block. I know I see this with the eyes of the maker, so I’m a bit skewed. But it pushed me to tackle the next block for our bee for Brioni. She chose the lone starburst pattern that can be found HERE. I decided if I was going to paper piece this then I would go ahead and fussy cut those centers. Why not? That’s the fun part about paper piecing. You can get some awesome fussy cut moments. And this makes me want to make a whole star with the Tufted Tweets Chairs especially. It was just the perfect scale for the star. But all of the pieces were fun to fussy cut and put “just so”. I did what I read suggested under the original designer’s instructions I believe and tried to alternate warm and cool colors around the star. It really helps make for a vibrant but balanced look. Two and half days of intense paper piecing makes me long for a bit of a break, but if/when I get the bug to paper piece again I would definitely come back to the bottom star and make one for myself. And if I’m feeling REALLY confident, I’ll tackle the starburst spools again. But I wouldn’t hold your breath. lol I have more and more respect for Charise who designed that and other paper pieced patterns. Incredible. They may have proved a challenge, but the results are amazing!!! You are so talented. These are yummy blocks, and the spools look darling. 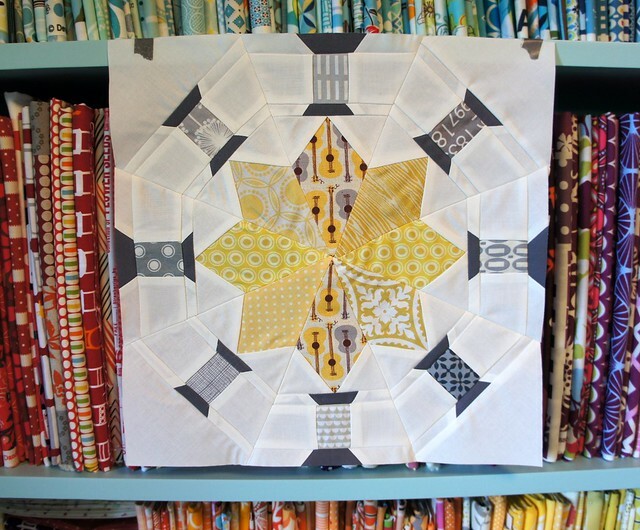 Love all them.These are fabulous blocks.The spool one catch my eyes! I really like both of those, great work, but I think for my first full size paper pieced block I better not try something so intricate! They both look so great! 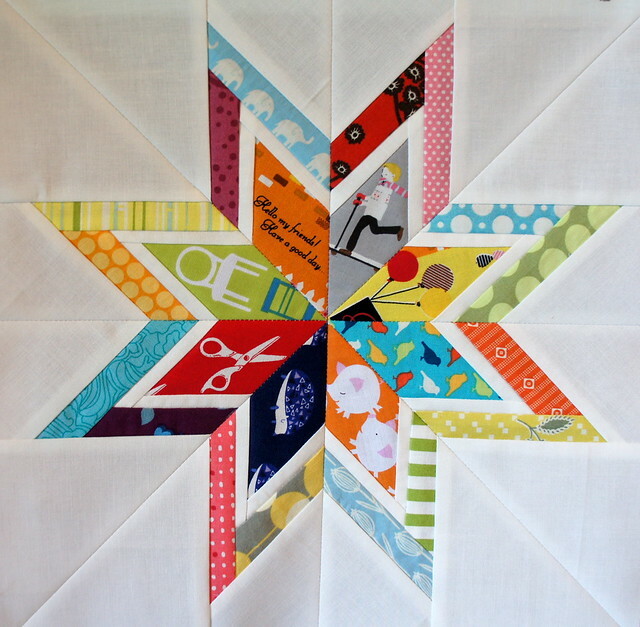 I really, really love the idea of the fussy cut centers on the scrappy star. 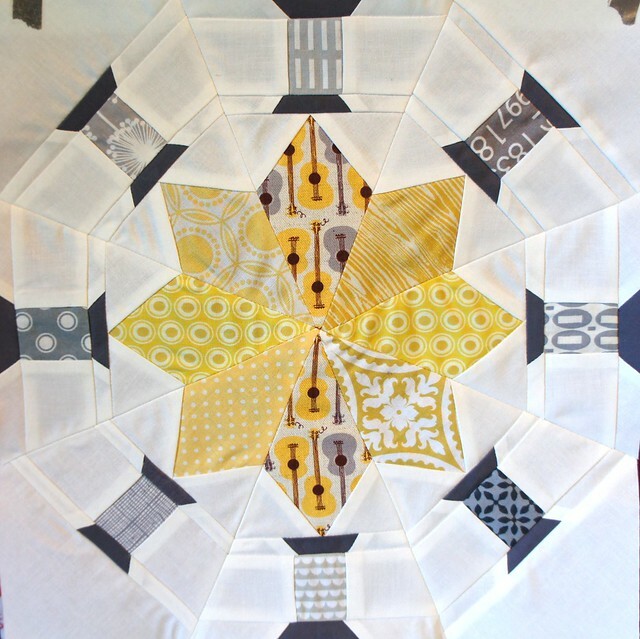 After making Brioni's block, I wanted to make my own quilt just like hers. This would be such a fun I-spy quilt. Thanks for the idea!! they do both look great! beautiful work friend! What a combination cotton reels to a star – love it with colours. The white is bright which shows how accurate the piecing is. 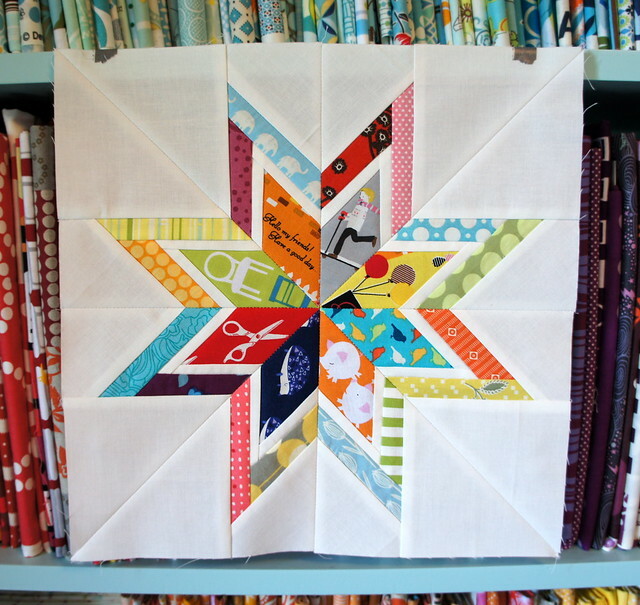 Thanks for sharing the fussy cut stars especially all the colours are popping out all over the place. Oh my, those are amazing!! The first is very cool – but I absolutely love the way you fussy cut the stars in the second one! Great fabric choices!! OOh, I like the second star too. Great use of color! The second block is amazing! I love the color, and what you chose to fussy cut. So fun! Paper piecing is so challenging. You did wonderful, though! Such fun pieces!